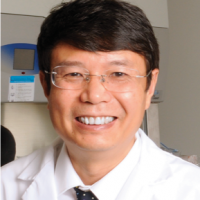 Dr. Daohong Zhou is a Professor in the Department of Pharmacodynamics at the College of Pharmacy and a Professor in the Department of Radiation Oncology at the College of Medicine, University of Florida (UF) at Gainesville. He serves as the Associate Director for Translation and Drug Development and the Henry E. Innes Professorsip of Cancer Research at the UF Health Cancer Center. Dr. Zhou received his medical (1978-1983) and graduate (1983-1986) training from Yunyany Medical College of Tongji Medical University and Henan Medical University, respectively; and his postdoctoral training (1990-1992) at the Johns Hopkins University School of Medicine. Before he joined UF in 2018, he was a Professor of Pharmaceutical Sciences and the Deputy Director of the Division of Radiation Health at the College of Pharmacy and the Associate Director for Basic Research at the Winthrop P. Rockefeller Cancer Institute in the University of Arkansas for Medical Sciences (UAMS). Dr. Daohong Zhou has published more than 100 peer reviewed scientific articles and book chapters. His research has been well supported by grants from various private and government funding agencies, including the National Cancer Institute (NCI) and National Institute of Allergy and Infectious Disease (NIAID). Dr. Daohong Zhou serves on several national and international peer review panels and as a reviewer for various scientific publications. He was a regular member of the Radiation Therapeutics and Biology Study Section at the National Institutes of Health (NIH) and a co-chair of the Panel Meeting for General Program of the Dept. of Health Sciences (Hematology) at the National Natural Science Foundation of China (NSFC). He is a Councilor of the Radiation Research Society (http://www.radres.org) and a co-founder of Unity Biotechnology (http://unitybiotechnology.com), a biotech that develops senolytic drugs for aging and age-related diseases. Dr. Zhou’s research has been focused on investigation ofthe long-term effects of genotoxic stress/DNA damage induced by ionizing radiation (IR) and chemotherapy on hematopoietic stem cell (HSC) self-renewal and genomic stability; and the role of HSC injury in IR- and chemotherapy-induced long-term bone marrow suppression and leukemogenesis. His studies has led to a better understanding of the cellular and molecular mechanisms by which IR and chemotherapy cause normal tissue damage and the discovery of the first potent and broad-spectrum senolytic drug, ABT263-a specific Bcl-2/xl inhibitor, that can selectively kill senescent cells to rejuvenate both prematurely senescent tissue stem cells induced by IR and tissue stem cells in normally aged mice. This discovery may lead to new therapeutics for various age-related diseases and the side effects induced by chemotherapy and IR. More recently, he developed several proteolysis targeting chimeras (PROTACs) that can target Bcl-xl and other proteins of interest for degradation via the ubiquitination and proteasome system. He found that Bcl-xl PROTACs can selectively induce Bcl-xl degradation in senescent cells and various cancer cells but not in platelets, suggesting that Bcl-xl PROTACs have the potential to be developed as a better senolytic and anticancer agent than ABT263 by not causing thrombocytopenia. Using the PROTAC drug development platform, he is developing additional specific antitumor agents. Xu G, Wu H, Zhang J, Li D*, Wang Y, Wang Y, Zhang H, Lu L, Li C, Huang S, Xing Y, Zhou D*, Meng A*. Metformin ameliorates ionizing irradiation-induced long-term hematopoietic stem cell injury in mice. Free Radic Biol Med. 16;87:15-25, 2015.